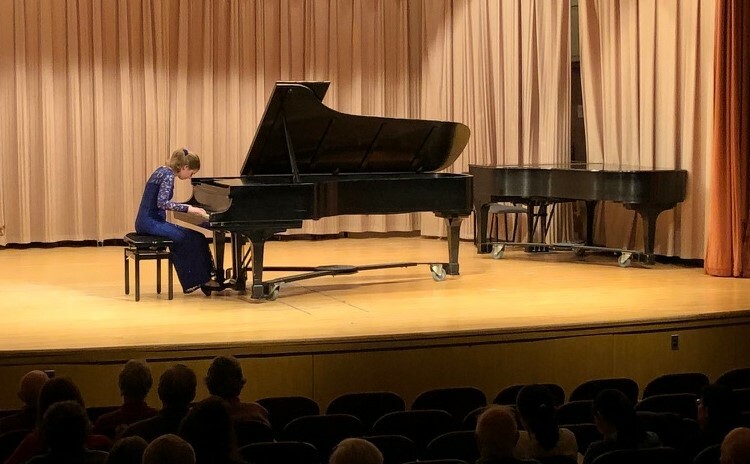 Four members of The Music School of Delaware’s esteemed piano faculty displayed their performing and compositional talents in a program entitled “Piano Majesty” Wednesday, November 14, 2018 at the school's Wilmington Branch. No piano concert would be complete without at least one work by Frederic Chopin, and this program featured two, both brilliantly rendered by David Brown. Brown is a pianist of unwavering mastery and musicianship with a towering but sublime strength and nuance that is both personal and telling. He was especially glittering in Chopin’s melodic Fantasy Impromptu, Op. 66 and the happy, cantabile character of the Barcarolle, Op.60, one of the composer’s finest works. in the Music Masters program, Piano Majesty. The program also featured a generous helping of original compositions. Jennifer Nicole Campbell applied her usual charm and impeccable technique to a rendering of Brown’s ethereal In the High Meadow. She also offered two of her own compositions, Prayer for the Right Hand, a left-hand piece she wrote to compensate for an injury she suffered to her right hand, and the lively Variations on Loch Lomond, which featured musical motifs from the pop and classical repertoire. The audience had great fun identifying the themes. She rounded out her set with a performance of Leschetizky’s Ballade Venitienne, Op. 39, No. 1 (Barcarolle). Brown offered a more solemn set of variations on the Baroque aria Bist du bei mir. Brown wrote the variations in 1993 and revised the work this year. In some pre-performance remarks, he noted that he was responding to the loss of loved ones by several of his friends over the past year. Liliya Maslov and Oleg Maslov delivered an edge-of-your seat rendering of Lutoslawski’s piano-slam Paganini Variations. The audience was transported to a cliff-edge zany and dissonance-allowed zone with superb playing from the duo in an intrepid choice of repertoire. The duo of Brown and Campbell opened the program with a performance of two selections by Schubert: the Allegro moderato and Andante (D. 968) and the March in D major, D. 733. It is great to learn these news. I love everything related to piano.